What’s Involved in Being Diagnosed With COPD? Chronic bronchitis and emphysema are two conditions commonly known by the umbrella term chronic obstructive pulmonary disease (COPD). Both diagnoses present similar challenges, and may occur separately or together. Recurrent respiratory infections. People who have infections are at an increased risk of developing COPD, and a person with COPD is at higher risk of contracting a respiratory infection — the problem becomes cyclical for many people. Air pollution. In most developed countries, the impact caused by air pollution is minor when compared to lung damage caused by smoking. However, in cities of developing countries, air pollution is a significant factor that contributes to the development and progression of COPD. Less than one percent of COPD cases are attributed to a genetic cause. A blood protein called AAT is produced by the liver and found in the lungs of 99 percent of people. If AAT is lacking, enzymes within the body destroy lung tissues. This usually occurs before age 40 and is most common in women who have a northern European heritage. Age. Some bodily changes may impede the movements of the ribs and the chest, which makes breathing more difficult and can cause frequent infections. Fortunately, age related changes do not usually result in COPD unless other factors, such as smoking, are present. People who have chronic bronchitis are usually diagnosed in their 20s. Shortness of breath develops late in the disease process. Excess mucus is common and may be green. The chest may be a normal shape or slightly barrel shaped. Wheezing and noisy respirations may occur. A serious heart condition, known as cor pulmonale, may occur repeatedly. Diagnostic tests conducted to assess chronic bronchitis include chest X-rays, arterial blood gasses (ABGs), hemoglobin, hematocrit, and lung volume measurements. Chest X-rays usually reveal an enlarged heart, congestion, and signs of chronic inflammation. Arterial blood gasses are frequently abnormal, with low levels of oxygen and high levels of carbon dioxide present. The hemoglobin and hematocrit levels are usually elevated, and lung volume is usually abnormal. Emphysema is a serious disease, characterized by permanent damage to the lungs. The walls of the airspaces within the lung tissues have been destroyed and permanently enlarged. People who have emphysema are usually diagnosed in their 30s, and significant disease is generally apparent by the the time they’re in their 60s. Most people diagnosed with emphysema are underweight or lose a significant amount of weight as the diseases progresses. Shortness of breath usually develops slowly, but may become disabling. Mucus is usually scant, and air movement within the lungs may be decreased. Diagnostic tests conducted to assess emphysema include chest X-rays, ABGs, hemoglobin, hematocrit, and lung volume measurements. Chest X-rays usually reveal a normal heart, widened spaces between the ribs, and over-inflated lungs. The chest may be barrel shaped. Arterial blood gasses are generally within normal limits or close to normal. The hemoglobin and hematocrit levels are usually normal unless the disease is advanced. Lung volume is usually abnormal. Diagnostic studies are used to determine if the COPD is caused by chronic bronchitis, emphysema, or both. Other respiratory infections and cardiac diseases are considered as well. 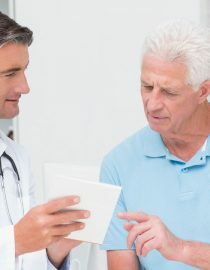 In addition to determining the primary cause of COPD, diagnostic studies are used to gather information in order to develop an effective treatment plan. Studies are used to evaluate the effectiveness of treatment, observe for complications, and determine the severity of illness. A complete history and physical examination is conducted. When COPD is in its early stages, chest X-rays and other diagnostic tools may not provide a clear picture of the disease process. For example, a chest X-ray may be normal in a young person who has COPD. Lung function tests, known as spirometry, are used to measure the lung’s capacity and working abilities. Measurements may be obtained prior to the administration of medications known as bronchodilators, which are used to open up the air passages. Spirometry may be repeated after the administration of bronchodilators to see how a person’s lung volume measurements change, which aids in diagnosis. Spirometry is also used as treatment for individuals afflicted with COPD. In addition to a respiratory assessment, a cardiac evaluation is an essential part of the diagnostic process. An exercise test can demonstrate a person’s ability to compensate for the decreased lung function. This may be given as a stress test on a treadmill. Stress tests are also sometimes given chemically, with medications. An EKG is obtained in order to measure how hard the heart is working. If cardiac studies are abnormal, further studies are provided. The cardiology workup determines cardiac function in general and specifically to see if the heart is enlarged or if changes have occurred within the blood vessels. Complex mechanisms within the body predispose people who have COPD to changes in cardiac function. Blood vessels may become constricted and pressure may rise in the lungs and heart. Blood sometimes thickens. In order to adapt, the right side of the heart may enlarge in order to be able to ensure blood is efficiently pumped to the lungs so it can become oxygenated. Heart failure may occur — this condition is known as cor pulmonale. When cor pulmonale occurs, the heartbeat is affected, neck veins enlarge, and excess fluid accumulates throughout the body. Oxygen, dietary restrictions, diuretics, and other treatments are needed to treat this complication of COPD. COPD is a serious condition. Early diagnosis and prevention are essential. Since COPD is a chronic condition, it is essential that you develop a relationship with a qualified health care provider early in your disease. Proper diagnosis can reduce the likelihood of complications, enhance your quality of life, and help you live longer.